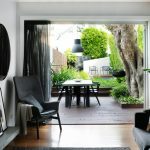 With a contemporary outdoor room, lush plantings and a warm, inviting colour scheme, the rear garden of this Perth home is designed to get you in the holiday mood no matter what the time of year, or the weather. 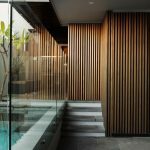 The owners wanted a modern Australian design; something in keeping with the contemporary interior of the home. 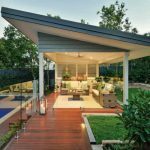 And as it was a tight block, they wanted a space-maximising design that would include more than one outdoor living zone as well as a small area where the kids could play. 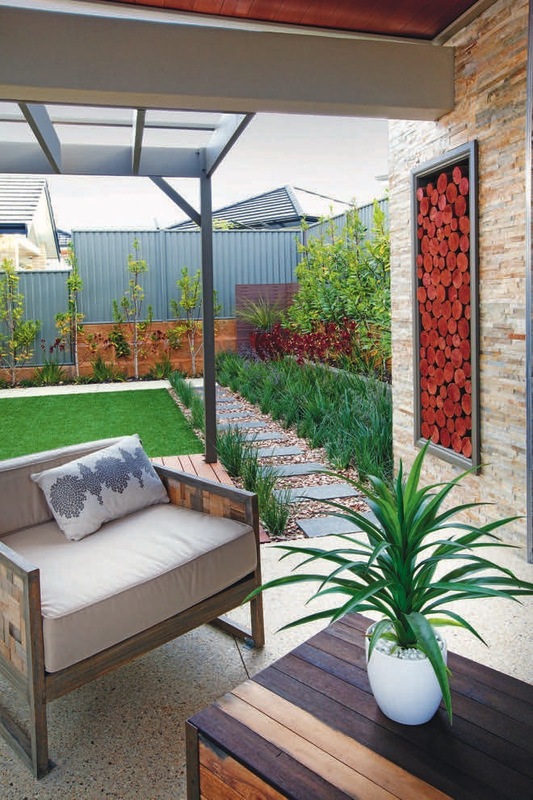 Realising they would need expert help to achieve all of this, they turned to designer Nic Russell from Landscapes WA. 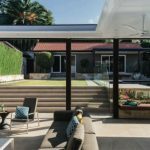 The alfresco entertaining area is the centrepiece of the new design and adds another living room to the home. 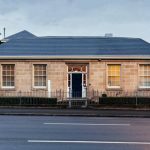 It has a kitchen with a built-in grill, bench space, storage cabinets beneath and a stainless-steel splashback. 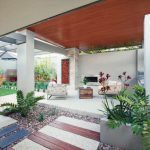 To make the space usable year-round, an outdoor fireplace with a stylish stainless-steel surround has been integrated into the rear wall of the outdoor room and positioned behind the seating area for maximum enjoyment. 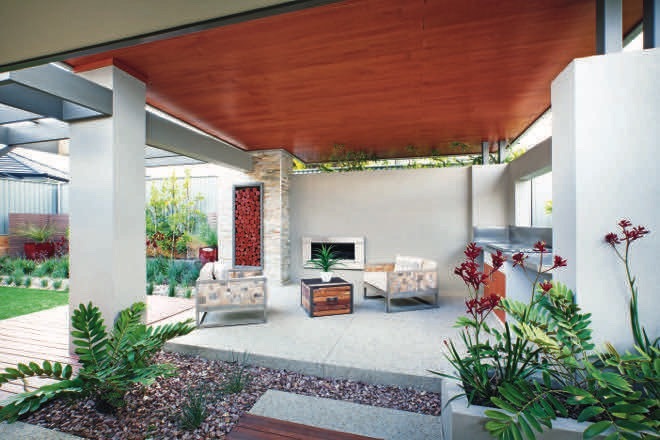 Referencing the outdoor fireplace is an inset feature wall panel of sawn wood. 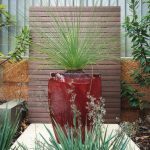 While this is purely decorative, it adds visual warmth to the area and offsets the floor of the outdoor room, which is of washed aggregate paving, a contemporary and practical choice. 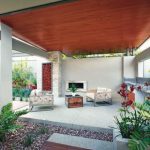 It also picks up on the warm, natural tones of the decking area, which sits on the lawn side of the pavilion beneath an open pergola. 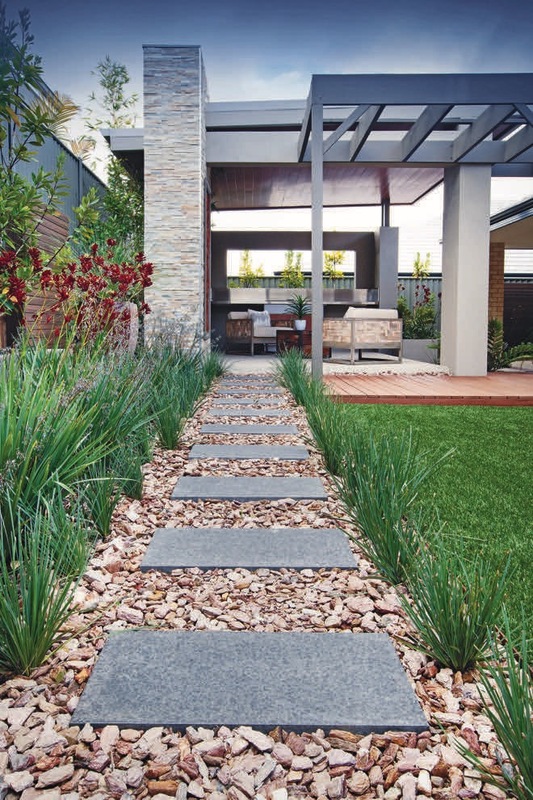 Leading from the outdoor room across the back of the garden is a path of granite steppers surrounded by Toodyay loose stones. 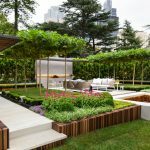 The same stones, in a mix of earthy colours, appear in other parts of the garden, visually connecting the various outdoor spaces. Most of the plants are easy-care native species. 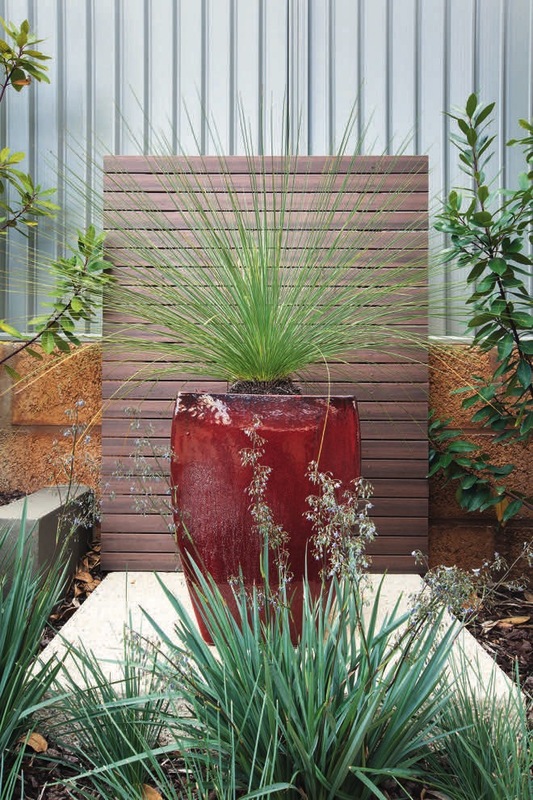 The larger feature plants include Xanthorrhoea preissii (grass trees that are native to Western Australia) and for mass colour, Anigozanthos ‘Big Red’ (a kangaroo paw that produces vivid red flowers in spring and summer), all of which are watered using sub-surface drip irrigation. 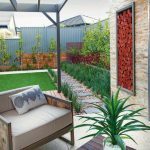 To mask the Colorbond fence erected by the home builder, Landscapes WA installed Modwood screens and strategically placed a variety of screening plants that will soon wrap the garden in a wall of green and provide a leafy and inviting outlook from the outdoor room and the home. 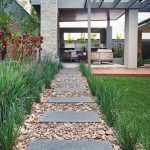 Landscapes WA specialises in hard and soft landscape design, construction and maintenance and works in tandem with homeowners and home builders to deliver every project on time and within budget. 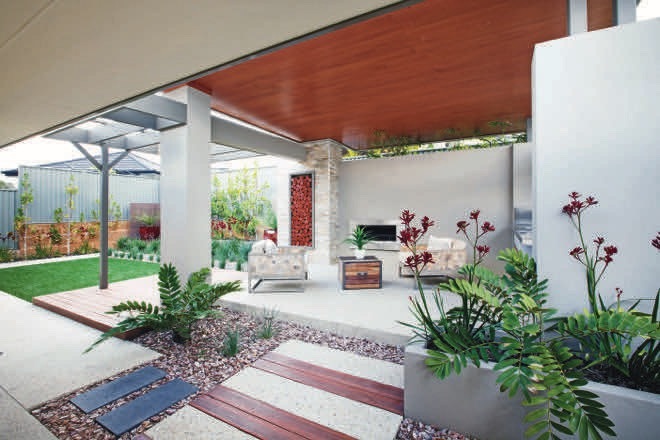 In designing and building this impressive garden, Landscapes WA worked closely with the home builder, Celebration Homes.